A collection of six cultivars named after early pioneers from the Wakatipu region of New Zealand. Aristotelia hybrids which naturally arise from the cross between A.serrata, a small ‘forest margin’ tree, and A. fruticosa, a sub-alpine shrub, are found throughout New Zealand. A x fruserrata is a species in its own right as it is able to reproduce itself. The original form of A. x fruserrata giving rise to the “Pioneer Collection” of cultivars or selections, was found near Lake Wakatipu, and was named after Christchurch botanist Hugh Wilson. The range of characteristics of A. x fruserrata include vase shaped bushes, compact round bushes, tall willowy shrubs to small trees, strong stocky bushes, squat/spreading types, and erect narrow forms. Some forms are outwardly floriferous, while in others, flowers and fruit are contained more within the bush. Many female forms produce an abundance of fruit - A. Jessie Cockburn (the last of the four below) is a great example. The foliage is very good for flower arranging, as it lasts well in water. 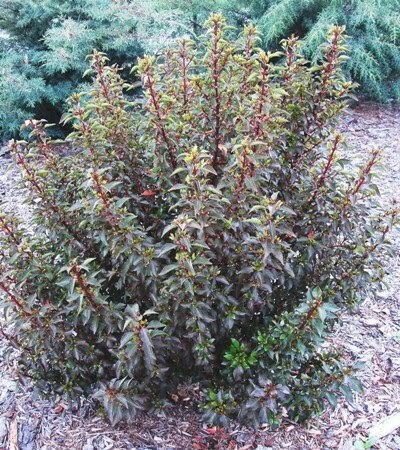 Some of the forms have foliage which darkens in colour or takes on a burgundy purple shade with the cold of winter e.g. A. Kingsley Butler and A. Rosie Buckingham. The lighter coloured new foliage of spring growth looks striking set against the darker foliage of winter. While the hybrid wineberries are semi-evergreen, losing some of the foliage within the bush in winter, the outer leaves maintain an evergreen effect albeit somewhat thinner than throughout the rest of the year. A. Jessie Cockburn has, in some locations, become wholly deciduous in winter. The “Pioneer Collection” selections have been trialed for more than 10 years to establish their true adult characteristics [the species exhibits juvenile foliage and colouring for the first few years]. The wineberries like to grow in well-drained soil; they grow in an open situation or tolerate some shade. The selections have been trialed with success near the sea and in inland areas. The “Pioneer Collection” selections have survived winters of minus 9 degrees Celsius. In a minus eleven degree frost [or when chill factors combined with the minus 9 degree frost], the plants’ foliage above ground died back but in the majority of cases the plants refurbished themselves from the base in spring. They withstand the strong drying winds and hot summers of Central Otago, where the selections have been bred, experiencing temperatures of between 30-40 degrees C.
While the hybrid wineberry selections hold their compact form well over time, trials have shown that even after 15 years the plants can be entirely refreshed by cutting the bush to ground level. The bushes regenerate with youthful vigor the following season. Burgundy leaf colour tones are a feature of some selections [e.g. A. Kingsley Butler and A.Rosie Buckingham] notably in juvenile plants taking on the deep burgundy coloration in response to winter chill. Cutting the foliage back after 3 – 5 years will keep this response apparent. The wineberries are great colonisers and quickly re-establish cleared sites. Such pioneering attributes make these plants highly suitable for establishing a new garden, for use by landscapers in mass plantings, and for re-vegetation projects. A.x fruserrata grows alongside species such as Pittosporum tenuifolium, Griselinia littoralis, Hebe salicifolia, Cordyline australis, Olearia avicenniaefolia.